North Korea Claims New Missile Makes It A Nuclear Power : The Two-Way Independent analysts agree that the North's latest ICBM could reach as far as the U.S. Eastern Seaboard, though some questions remain. A man in Seoul, South Korea, watches a local news report about North Korea's missile launch on Wednesday. North Korea says a new intercontinental ballistic missile tested on Wednesday proves it has a nuclear deterrent that can reach any target in the United States. According to a statement from the Korean Central News Agency, the ICBM is capable of carrying a "super-large heavy warhead, which is capable of striking the whole mainland of the U.S."
The missile was launched in the early morning hours local time on Wednesday from a site near Pyongyang, the North Korean capital. It soared almost 2,500 miles into space and traveled a distance of around 620 miles east before crashing into the Sea of Japan. The total flight time of 53 minutes was longer than North Korea's two previous ICBM tests. The missile was lofted high into space on a "fly-ball" trajectory, as a way to avoid alarming neighboring nations. But independent analysts say that if it had been aimed differently, it could have traveled more than 8,000 miles. "This range could cover all of the mainland United States, including Florida," says Melissa Hanham, a senior researcher at the James Martin Center for Nonproliferation Studies in Monterey, Calif. "It's a much farther range than they had ever demonstrated with their previous ICBM tests." In response to the test, President Trump tweeted that sanctions would soon be ratcheted up on the North. Just spoke to President XI JINPING of China concerning the provocative actions of North Korea. Additional major sanctions will be imposed on North Korea today. This situation will be handled! North Korea has long had a stated goal of being able to hit anywhere in the U.S. with a nuclear-tipped ICBM. The North's young leader, Kim Jong Un, has posed in front of maps targeting cities such as New York and Washington, D.C. This latest test appears to show the country has that capability, says Vipin Narang, an associate political science professor at the Massachusetts Institute of Technology. "I think they're confident now that they can hold the U.S. Eastern Seaboard at risk, which is a big deal," Narang says. North Korea designated its new missile a "Hwasong-15." In July, it conducted two tests of the Hwasong-14, an ICBM capable of hitting targets in much of the U.S. mainland. Many experts suspect the "new" missile might actually be a variant of the Hwasong-14. "Maybe it's a higher-thrust engine on the first or second stage," Narang says. "But until we see pictures, we don't know what it is." This new missile is designed to deliver a nuclear warhead that the North has been testing separately underground. Earlier this year, North Korea conducted its largest nuclear test yet. Independent monitors put the yield in the range of 100 to 600 kilotons, similar to that of modern U.S. nuclear weapons. News reports in August stated that the U.S. Defense Intelligence Agency now believes that North Korea had "miniaturized" some of its nuclear devices in order to fit them onto a missile. Not everyone believes the North's claim that all this activity means the country can strike the U.S. with a nuclear warhead. 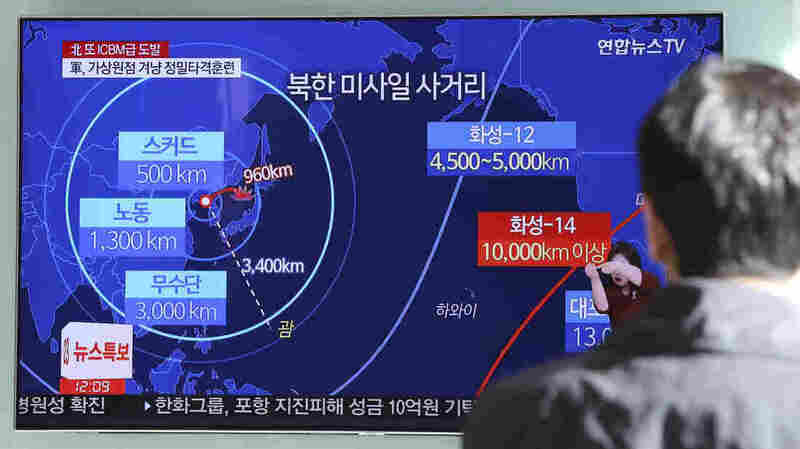 "There are a lot of things that are still not 100 percent sure about North Korean missiles," says Markus Schiller, an aerospace engineer with ST Analytics, a German company that consults on security issues. There are still questions about accuracy, practical use and whether a warhead could survive launch and re-entry, he points out. But Narang says that continuing to doubt the North's capabilities might be dangerous. The ultimate proof that the North can do what it says would be the launch of a live nuclear warhead over the Pacific Ocean. North Korea has suggested it might try such a test, but Narang and many others think that could prove catastrophic. "There's just a lot of risk of things going wrong," he says. In the end, even if the North's claims that it can strike all of the U.S. aren't completely proven, Narang suspects policymakers might need to accept North Korea as a nuclear power. "Do they need to hit New York with certainty and accuracy? No," he says. "A 30 percent chance that they can park one on the Upper East Side is enough to deter us." A previous version of this story identified Markus Schiller as an aerospace engineer at Schmucker Technologie. He is in fact at ST Analytics.